Once again, readers, I apologize for doing a story on a non-harp guitar; this one was just too cool (and vaguely related) – I had to do it! 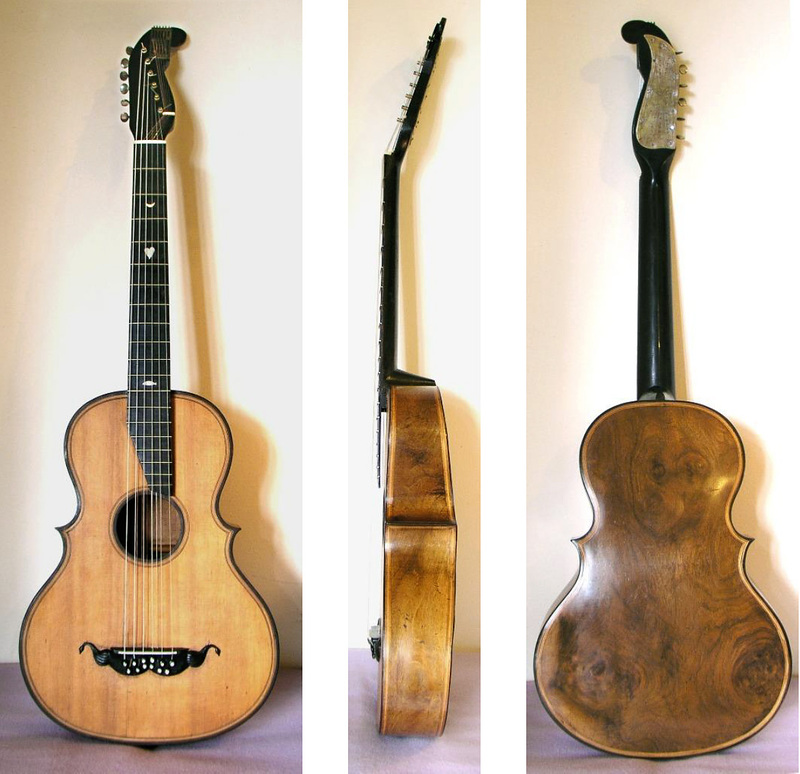 Luthier Down Under Ian Watchorn (who over the years has generously contributed much important harp guitar information to this site) just informed me of his latest restoration: perhaps the first original guitar d’amore ever found! The existence of the guitar d’amore is mentioned in period literature, the instrument presumably based on the well-known viola d’amore (at right), which has sympathetic strings running under the fingerboard. Not to be confused with the arpeggione, or bowed guitar, the guitar d’amore would thus be played like a standard fretted guitar, with untouched sympathetic strings adding something to the sound. Which is exactly what this instrument is. Ian documented the project on his web site here. It includes full details, both before and after restoration photos, plus correspondence from experts Jan Tulacek (a luthier on HG.net) and Andreas Michel of the Leipzig music museum that identify the instrument as likely being made by violinmaker Tomasz Zach in Prague. The inscribed date is either 1850 or 1856. Note the nod to the violin family with the body points. Did you spot the second bank of strings? 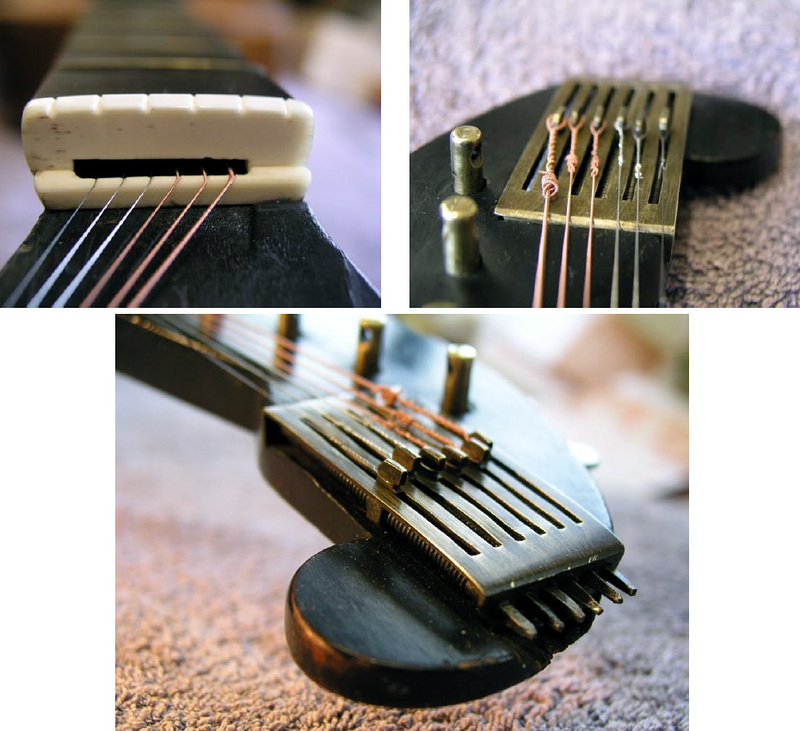 Having their own set of bridge pins, the sympathetic strings thread through the bridge like so. I wonder about a clean, specific point of contact. Here, you can make out how they run parallel to the main strings under the very delicate raised fingerboard and through the neck! At the other end, they emerge from a “double nut,” to be tuned via a Preston guittar-like watch key mechanism. Well, it does the trick. 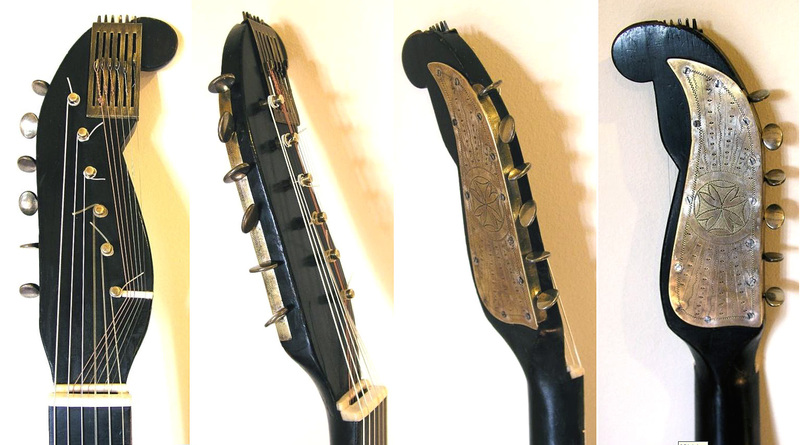 I would have tried to run them out the back of the headstock and/or used a different shape other than the Stauffer-style. Pretty clever, though! Of course, this is not the only guitar known with sympathetic strings (Fred Carlson has made a career out of his sympitars), but it may be the earliest I’ve seen, and represent a true “guitar d’amore.” I’ve added it to the Sympathetic String Guitars Gallery, where you can see other inventions, including 7 later, novel patents for achieving such an effect. This gives me some good ideas! Thanks for posting. A certain member of the hg community has asked me about a symp string hg. After the first one i made, i swore i would never build another, but this….this gives me some ideas.